We all love letting our kids run around freely. Seeing their laughter brings smiles to our faces. But what happens when you are at a busy place, filled with hundreds of people? It's hard to catch up to these little sprinters when your hands are tied. Avoid the risk of your little getting into dangerous, uncontrolled situations or even getting lost. PARENTAL PEACE OF MIND: Made to last! Durable Stainless Steel and PU cover that's difficult to be cut by knife - Ensures your children's safety while giving them confidence to walk freely & encouraging them to explore their environment. 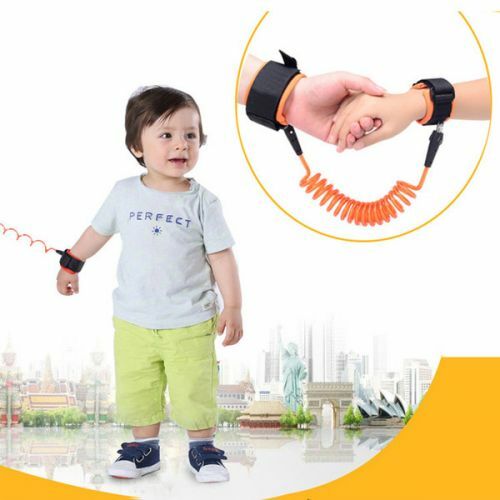 HIGHLY DURABLE & PRACTICAL: The advanced design of our Child Safety Bracelet features a kid's wrist link that sports double stickers to make it very difficult for them to take it off on their own, while the parent's strap is of a larger size for maximum comfort while wearing it. SOFT & COMFORTABLE: Both our wrist links feature a comfortable wrist strap cloth with a soft sponge pad that feels silky smooth upon touch. That way it is ensured that both the parent's and the kid's skin are not hurt in any way and they remain ultra-comfortable to wear. CONVENIENT: Great for trips to the Zoo, Park, Supermarkets, Subways, Airports or other crowded places.